Mastic has been harvested for at least 2,500 years since Greek Antiquity. The word mastic is derived from Greek: μαστιχειν, translit. mastichein "to gnash the teeth", which is also the source of the English word masticate.. The first mention of actual mastic 'tears' was by Hippocrates. Hippocrates used mastic for the prevention of digestive problems, colds and as a breath freshener. Roman emperors used mastic along with honey, pepper, and egg in the spiced wine conditum paradoxum. Under the Byzantine Empire, the trade of mastic was made the emperor's monopoly. In the Ottoman Empire, the sultan gathered the finest mastic crop to send it to his harem. During the Ottoman rule of Chios, mastic was worth its weight in gold. The penalty for stealing mastic was execution by order of the sultan. In the Chios Massacre of 1822, the people of the Mastichochoria region were spared by the sultan to provide mastic to him and his harem. Sakız Adası, the Turkish name for the island of Chios, means "island of gum". The mastic villages are fortress-like, out of sight from the sea, surrounded by high walls and with no doors at street level (meaning that the villages were entered only by ladders), in order to protect the sap from invaders. Producing the mastic resin is a whole-year process for the local growers. The harvest is known as kentos and takes place from the beginning of July to the beginning of October. 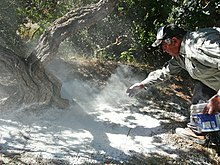 First, the area around the trees is cleared and sprinkled with inert calcium carbonate. Then, every 4–5 days, 5–10 incisions are made in the bark of each tree to release the resin. 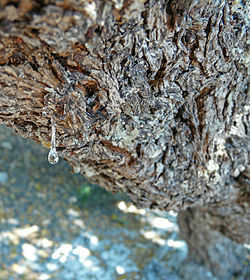 As these clear drops hang from the tree, and sparkle in the sunlight, they are said to resemble crystalline teardrops; for this reason, the mastic resin is known as the "tears of Chios". It takes about 15–20 days for the first resin crystals to harden and fall to the ground. The farmers then collect the pieces of dry mastic and wash them in natural spring water, and spend most of the winter cleaning and separating the tears from the sand. This cleaning process is performed by hand and is regulated by the legislative framework of the Mastic Growers' Association. In addition to mastic, mastic oil is also produced. Mastic may have some value in preventing tooth decay and gingivitis as chewing mastic appears to reduce oral bacteria. In Medieval times, mastic was highly valued by sultans' harems as a breath freshener and a tooth whitener. In India and Persia, mastic was used to fill dental cavities. One of the earliest uses of mastic was as chewing gum; hence, the name. Mastic-flavored chewing gum is sold in Syria, Lebanon, Turkey, and Greece. Mastic is used in ice cream, sauces, and seasoning in Lebanon. In Egypt, mastic is used in vegetable preserves, in jams that have a gummy consistency and in soups. In savoury dishes Egyptian chicken, duck, rabbit and fish recipes often call for mastic, usually paired with cardamom. In Morocco, mastic is used in the preparation of smoked foods. In Greece, mastic is used in liqueurs such as Chios Mastiha, in a spoon sweet known as a "submarine" (Greek: υποβρύχιο, translit. ypovríchio), in beverages, chewing gum, sweets, desserts, breads and cheese. It is also used to stabilise Turkish delight and ice cream. Some scholars identify the bakha mentioned in the Bible with the mastic plant. Bakha appears to be derived from Hebrew: בכא‎, weeping, and is thought to refer to the "tears" of resin secreted by the mastic plant. The rarity of mastic and the difficulty of its production make it expensive. 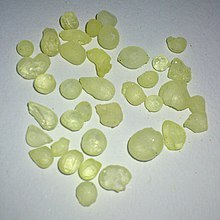 As a result, imitations in the form of other resins appear in the market, sold as "mastic", such as Boswellia or gum arabic. Other trees, such as Pistacia palaestina, can also produce a resin similar to mastic. Yet other substances, such as pine tree resin and almond tree resin, are sometimes used in place of mastic. ^ "Mastiha Growers Association". www.gummastic.gr. Retrieved 2016-06-20. ^ Evgenia Choros. "Chios Mastic Museum Opened Its Doors on June 11th". Retrieved 2016-06-21. ^ "The Chios Mastiha Museum". Retrieved 2016-06-21. ^ Gönderen Burçin ÇOKUYSAL (1923-03-20). "ECOLOGIC EVALUATION OF Pistacia lentiscus (MASTIC) IN ÇEŞME PENINSULA". Burcincokuysal.blogspot.com. Retrieved 2013-06-18. ^ TEMA Foundation. "Sakız Ağaçlarına Sevgi Aşılıyoruz Projesi'nde yeni bir dönem başlıyor". Retrieved 2014-06-06. ^ Paraschos S, Magiatis P, Mitakou S, et al. (February 2007). "In vitro and in vivo activities of Chios mastic gum extracts and constituents against Helicobacter pylori". Antimicrobial Agents and Chemotherapy. 51 (2): 551–9. doi:10.1128/AAC.00642-06. PMC 1797732. PMID 17116667. ^ co., Benetos John – Galatoulas George. "Chios Mastic gum information". www.mastic.gr. ^ "Amazon.com : Lebanese Chiclets – Mastic Flavor : Chewing Gum : Grocery & Gourmet Food". www.amazon.com. ^ "savoury mastic : anissa's blog". www.anissas.com. "Mastic" . Encyclopædia Britannica (11th ed.). 1911.